When I was 46, I watched my niece cross the finish line at the Rock n Roll Marathon and thought, "I have to do this!" My husband's answer? "Well, have fun, baby." Truth is, I never thought it was possible, but I gave it a try anyway. 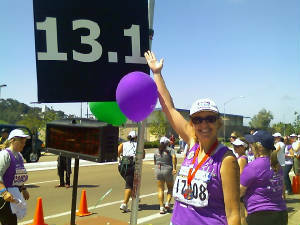 I ran with an amazing group -- Team in Training -- and, in 2008, completed my first half-marathon. I loved Team in Training, but was a bit daunted by the fundraising, and I wasn't so happy with the other local running group I joined. Although I met wonderful people, the group seemed dedicated to the faster athletes, and I just didn't feel the love. Sole was Soul was born out of the desire to give people at EVERY age and running level a place to be both challenged AND supported. Many of our members run "Intervals." That means you run 5-10 minutes, then walk two minutes, then repeat! We also have runners who run straight through. And walk straight through. You will never be pressured to go faster, unless you want to, and there will always be people cheering you on at the end. We want to challenge ourselves in a way that feels good. Start slow, and build as your ready. This is super-important: I am not a doctor. I'm not a certified coach. I have no medical training. Please consult with your physician before starting any exercise routine and if you have any aches or pains as a result of your exercise routine. I cannot advise or treat you. You need to assume complete and total responsibility for your health decisions. Whew! That's done! So what I CAN do is cheer you on and help you know that you can do it! We'll help you know what works for us and what we've learned. And we'll be there for you -- every step of the way. One great way to ensure you keep training is to register for an event. With enough time, ANYONE can run a half-marathon. Talk to any member or check out our Facebook page for all the races someone from our group is participating in!